We celebrated Valentine’s Day a bit early because John has to be out of town. As you know, I belong to 3 on-line cooking groups – two of them had recipes scheduled that fit in perfectly with our menu, so I made them a bit early. 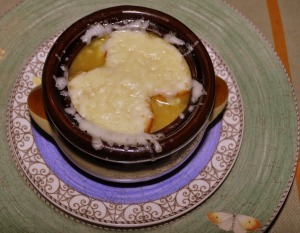 For a starter, we made Dorie Greenspan’s Cheese-topped Onion Soup. It was terrific, and not at all difficult, but it takes time to caramelize the onions to get the color & flavor just right. We laughed our way through delightful strings of melted cheese and bites full of soggy bread and soft, pungent onions. 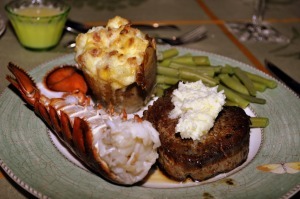 Next, we had plates full of delicious Filet Mignon with Parmesan Butter from Williams-Sonoma The Cook and the Butcher, Steamed Lobster Tails with Lemon Butter, Twice-Baked Potatoes, and Steamed Green Beans. Cut the lobster tails up the underside with kitchen shears, then steamed them for 15 minutes. 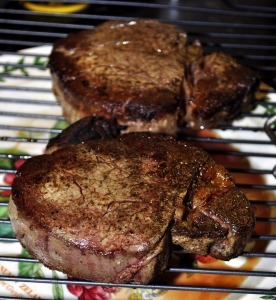 We pulled the white meat from the shells and dipped it in Lemon Butter – 1 stick of butter melted with 1/4 cup lemon juice. Wrap the potatoes in foil and bake for 1 1/2 hours. Remove the potatoes from the oven and allow to cool until they can be easily handled – about 20 minutes. Using a sharp knife, cut then in half and cut the rounded ends off so they can stand up. Using a grapefruit spoon, remove the center of each potato, scraping in a circular motion, and leaving about 1/4 inch of potato attached to the skin. When filling is completely blended, refill the potato shells, mounding the tops. 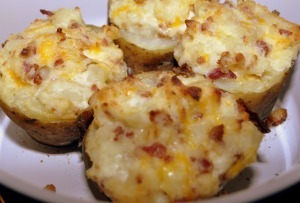 Return the potatoes to the oven for about 20 minutes until they are lightly browned on top. Add green beans, salt and pepper. We served all of this with Mosby Winery’s Stellini di Moscato – a lightly sweet sparkling California wine. 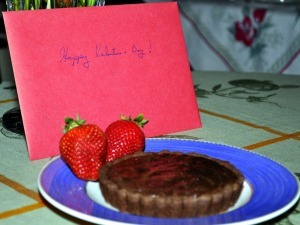 For dessert, we had Julia Child’s Chocolate Truffle Tartlettes! And, they were fabulous with fresh strawberries! What a wonderfully romantic meal…Awesome. Thanks for sharing your meal with us. John is one lucky guy!!! What a marvelous feast…I love it all. Can’t wait to make that French onion soup…mmmmmm. I’m totally lucky, too! We did all of this together! Susan, I want to be your Valentine! What a incredible dinner! I made the mussels and chorizo for Valentines Day…mussels are a favorite for my husband! I’m not sure I would even know a ‘special dinner’ at your house my dear since they all seem so well put together and put together! Those potatoes are my favorite! Wow! Why would anyone want to go out for dinner on Valentine’s Day when you could have a meal like yours?! Everything looks perfect, Susan. I bet John was one happy Valentine! You did it! 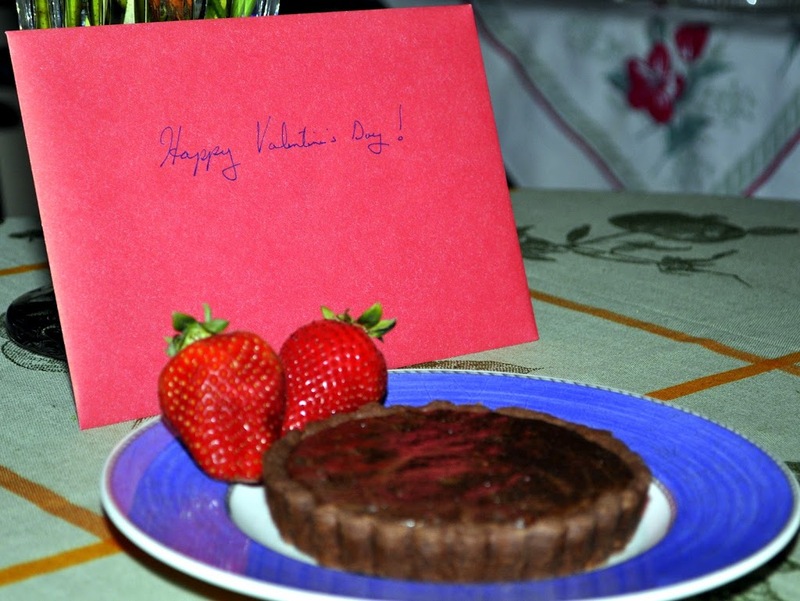 You created an amazing meal and the chocolate tart fit right it. A great ending to a great meal! Susan, Does John travel in his profession work? If so, when he’s go, can I “play” John? And, if it’s a holiday, so much the better. What an absolutely delicious and romantic Valentine’s Day Feast. If I were in France, I would say, “c’est très magnifique”. But, since I’m in Cambria, California (which isn’t at all bad – I am not complaining), I’ll just say, “Well done!”. Glad you two enjoyed the soup!